Calling from a tour stop in North Carolina, singer-guitarist St. Vincent admits that she’s “never home.” That’s certainly been the case for the past decade; her resume includes stints with The Polyphonic Spree and Sufjan Stevens before she embarked on a solo career in 2007. 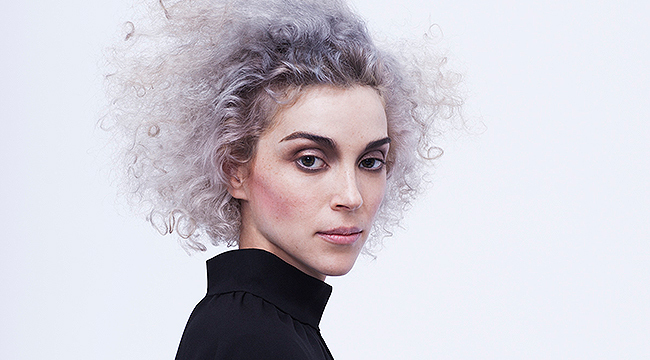 Additionally, she worked with ex-Talking Heads frontman David Byrne, even collaborating on a 2012 album. In her terrific new self-titled album, the singer-guitarist lays down some noisy guitar riffs. A heady mix of electronica and indie rock, the album is getting rave reviews. She spoke to us about it during a quick, 14-minute phone interview. I thought you handled Stephen Colbert’s questions quite capably during your recent interview on his show. Steven is a lovely guy. He’s a real music fan. Every late night show has its own personality. Some are more fun than others because of the personality. Colbert is absolutely a delight to be on. I would be terrified because you never know what he might ask. I think if you take yourself completely seriously, then you shouldn’t go on the Colbert Report. So we can assume you don’t take yourself completely seriously? I take music very seriously and I care about it so much but human beings are full of grandeur and squalor in equal parts so I don’t take any person that seriously. I’ve read articles that make you sound like a difficult person to read. But you didn’t come off that way on TV. Is that a misrepresentation? I have no idea. I can’t speak for whoever is writing the article. Perhaps they have a deficiency that I’m not aware of. I wouldn’t put it all on me. I’m from Texas so I value manners and politeness and all that so I tend to conduct myself that way in interviews. Talk about the decision to make your fourth album your first self-titled album. Are you making a statement of some sort? It wasn’t laziness. I was reading Miles Davis autobiography and he said that hardest thing for a musician to do is to sound like yourself. He was thinking more about horn players and somebody having an unmistakable sound. It’s true. You hear one note and you know it’s Miles Davis. Same with Coltrane or any of the great singers. You hear one syllable of Sarah Vaughan and you know it’s Sarah Vaughan. The same goes for Tom Waits. The key isn’t to be perfect, but to be more perfectly yourself and more singular–not somebody you can mistake for dime-a-dozen music. I love that book that Miles Davis did with Quincy Troupe. A little anecdote about that book. Somebody asked Quincy about the language that he left in there and why he left in there. He said, “Are you kidding me? I cleaned up the language. This is the sanitized version of what he actually said.” People should definitely read the autobiography. How many different instruments do you play on it? I’m playing all of the guitar on the record. I’m playing a tiny bit of the synths and I’m singing. It’s other people doing drums and mini-Moog. Did you make a choice to focus on the guitar on this outing? I’m mostly a guitar player. I’ve been playing guitar for 20 years. I like the fragmented nature of the lyrics in “Huey Newton.” Talk about what you were going for in that song. I wasn’t trying to go for anything. I was just writing a very stream of consciousness lyric and not censoring any of it in the moment. It was based on an experience I had where I was on tour and in Helsinki and I took an Ambien to fall asleep. I didn’t go to sleep. I just started hallucinating. I don’t take Ambien anymore. It’s a very heavy drug. It’s a prescription drug. It’s not illegal, but it’s pretty intense. I had this premonition that Huey Newton was in the room. I promised to write him into the song. The lyrics came to you during that moment? “Digital Witness” is such good fun. What inspired the song? Was it a particular incident? Not a particular incident. I’m just wondering generally where are we now and where are we going. And how is the constant access to information and the constant interaction with screens affecting our brains in the long-term and in the short-term. I noticed it in myself. Rather than just experiencing something, we’re more accustomed now to documenting that experience, almost to the point that we stop knowing how to have an actual experience. I’m trying to unpack and understand that phenomenon. It’s like when you go to a concert and everyone is taking photos or recording with his or her phone. I can’t believe it’s much fun for you to see all the phones and cameras. It’s not but I politely encourage people to be present. However they’re able to accomplish that. You worked on a tour manager for Tuck & Patti as a teenager. What was that experience like? They’re my aunt and uncle. I learned so much from them over the course of a number of years touring with them. They are incredibly hard working. I saw the underbelly of being on the road, not that they lived dangerously by any means. But I saw that it’s hard work and not just glamour all the time. I saw the power of the live performance. They would go in and move people to tears every night. A lot of times, they would move me to tears. I just thought that was such a wonderful way to exist in the world because lot of people have to make a living exploiting somebody. If I’m not going to be a social worker or a humanitarian, it’s better to go through life knowing you’re not exploiting anyone and putting more suffering into the world than existed before. What made you want to pursue a solo career? I always was doing that. I played in bands but when I played in bands, I was working on my solo record. That’s what I’ve wanted to do since I was a kid. Talk about the current tour. Sounds like it will have a strong visual element. I spent a lot of time thinking about the visual aspects of the record and for the tour. I was influenced by Holy Mountain and the Memphis design movement and all manners of things. I just wanted to make a live show where the visual component told an additional story. Once you’re aware of the language, how can you ignore it?